A delightful combination of a flickering flame and the sound of running water. This ceramic table top fountain includes a metal cup in the top for a citronella flame or the oil of your choice. A small pump inside the ceramic housing pumps water up to the top. It trickles over the edge and into the reservoir at the base. This combination fountain and lamp will add some warmth and ambience to your outdoor space. Place it outside on a patio, or use inside on the sun porch. Electricity is required for operation of this combination fountain and lamp. 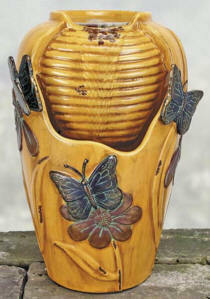 Refresh your mind, body and soul with this handcrafted porcelain water fountain. Perfect for the home and office to replace tension and stress with inner security.Turn the stress of a busy office or hetic household into a momentary island getaway with the peaceful sound of gently running water. Suitable for any room, this fountain is handcrafted. The fountain is operated by the small water pump at the bottom of the fountain. Water circulates through a tube, emerges out the top and recirculates. Handcrafted and beautifully glazed this frog in a lily pad fountain will be a delightful gift for anyone that receives it. Such a beautiful table top water fountain. This attentively crafted hummingbird fountain can help ease the tension or stress of a busy day with the calming sounds of water. Enjoy this handcrafted fountain, the beautiful design, and the sound of the water. 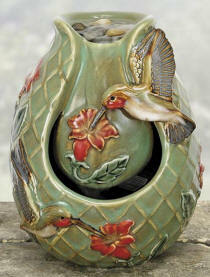 With a pleasing round jar shape, it features handsome raised details and sculpted hummingbird figures. A curving, slotted spillway lets you watch and listen as water overflows and softly descends into the collecting pot. Natural tranquility in a table top or desk fountain. Hand glazed porcelain in butterfly verdigris brown glaze. 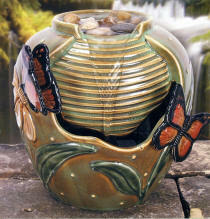 This butterfly fountain features blue butterflies on flowers against a bronzed background. The unique finish has a weathered patina that makes it look antique. This beautiful fountain will be a beautiful complement to any room of your home. Made for interior use, it can be used outside under protected conditions. Safe and easy in-line on/off switch. An unusual piece of outdoor decor, this ceramic table top fountain includes a metal cup at the top for a citronella flame or the oil of your choice. It's a beautiful way to keep the bugs away, and add some light to your outside seating area. You will also enjoy the sound of the water trickling down the side of the fountain. Water will collect in the reservoir at the bottom and is pumped to the top by the motor inside. Electricity is required for operation of this table top fountain.